It rained all the way back to Atlanta yesterday, but before I got into the serious bit of the driving, I made a stop in Columbia, SC, where I went to college. After petting a very fat cat, I was told that Columbia is home to a bakery that has gluten free cupcakes. Of course I went there, and I liked it so much I took some pictures to show you. 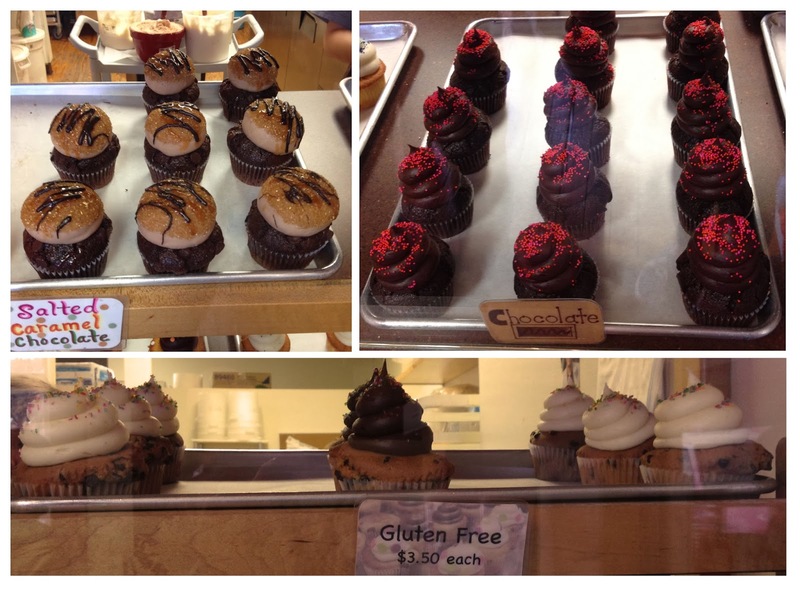 The Gluten Free cupcake of the day was chocolate chip, and that sounded spectacular to me. I had one with cream cheese icing, and it had none of the graininess you sometimes find with gluten free baked goods. And of course the colored sugar sprinkles were a nice touch. Behind the gluten free cupcake, you'll find a red velvet cupcake topped with a generous amount of cream cheese frosting and a little heart. so cute. It may surprise you to know I've never really been a huge cupcake fan. You'd think that the single serving size would be perfect for a spinster, but I really prefer a real piece of cake. However, now that I'm (annoyingly) gluten free, any baked good I can eat is absolutely more than welcome. I crave the sweetness and the carbs…together. The whole cupcake shop, complete with it's cupcake truck was super cute. I especially liked the look of the salted caramel and chocolate cupcakes, whose tops were both exquisite. Of course this was a perfect opportunity for spinstergramming. 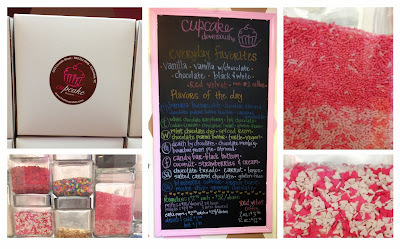 So, below you'll find a few more photos of the cupcakes, the menu, and a few more things. Enjoy! Check out Cupcake Down South's website here!